MooGoo Post Hair Removal Cream is a moisturiser that helps skin recovery from hair removal processes such as waxing, shaving and laser treatments. 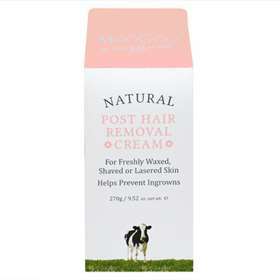 While moisturising this Udder Cream based product also helps to prevent ingrowing hairs by stopping the pores becoming contaminated. Suitable for use after waxing, shaving and laser hair removal. Free from Paraffin, Parabens & Phenoxyethanol. Apple the cream just as you would a normal moisturiser for a few days following hair removal.